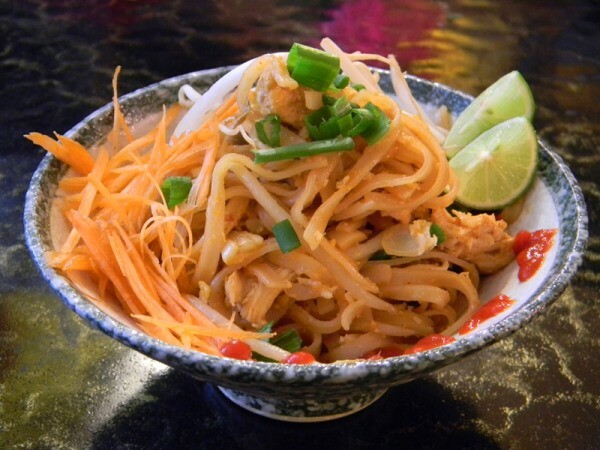 If you are a fan of Pad Thai, make one of these delicious variations at home anytime. This page contains Pad Thai recipes. I wanted to learn how to make Pad Thai in honor of my best friend who was from Thailand, who passed away from a stroke. My favorite memories of her were of us laughing together over a good, authentic Pad Thai. This recipe is easy and so delicious! Soak the dry noodles in lukewarm water while preparing the other ingredients, for 5-10 minutes. Do not over soak as they will get mushy. Heat it up a wok or large pot on high heat and pour in oil. Fry the peanuts until toasted and remove them from the wok. Add shallots and garlic, stir them until they start to brown. The noodles should be flexible but not expanded at this point. Drain the noodles and add to the wok. Stir quickly to keep things from sticking. Add tamarind, sugar, fish sauce, and chili pepper. Stir. The heat should remain high. Make room for the egg by pushing all noodles to the side. Crack the egg onto wok/pot and scramble it until it is almost all cooked. Fold the egg into the noodles. Add shrimp and stir. Add bean sprouts and green onions. Stir a few more times. The noodles should be soft and very tangled. Pour onto the serving plate and sprinkle with peanuts. Serve hot with wedge of lime on the side and green onions and raw bean sprouts on top. The second time I made this I had no fish sauce, so I used oyster sauce with a bit of rice wine vinegar in it - it was perfect! You can also find powdered tamarind in almost any major grocery store in the international section. It's usually less than a buck! Easy, flavourful and inexpensive to make. I was craving pad thai and combined a few recipes I found into one, and added my own twist to it as well. I used to use another recipe but found it a bit dry and tasteless so I created this one. Everyone who tasted it gave it a thumbs up! Combine all sauce ingredients and mix well. Set aside. Boil a big pot of water, then take of heat and immerse rice noodles and sprouts for 7 minutes or according to package directions. Drain and set aside. In a wok or large pan, heat 1 Tbsp of sesame oil then add carrot, ginger and green onions and fry for a minute. Add tofu to heat up. Then add noodles/beans and mix well. Add sauce and mix until well blended. Serve with chopped coriander and peanuts. A meal you can whip up easily and enjoy with a balance of protein and vegetables. You can hold the meat, add more or less vegetables depending on your preference and what you have on hand. Our take on a Thai classic. Fettuccini noodles, carrots, red pepper, green onion and your choice of tender chicken breast or juicy shrimp, all tossed in our spicy Pad Thai sauce. Drizzled with peanut sauce then finished with chopped peanuts, fresh cilantro and lime." The US chain is called Boston's Gourmet Pizza but according to their website, they don't serve Pad Thai. 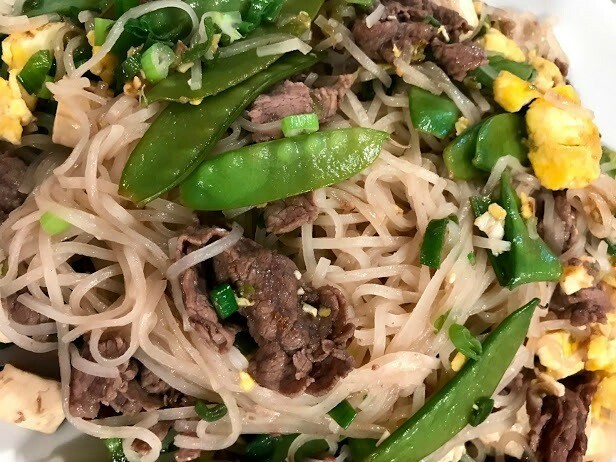 I was so hoping to find the recipe on the computer because I love the Pad Thai from Boston pizza. But after a lot of searching, I still haven't found it. I will check back here hoping that someone will fess up the recipe so we can all enjoy it. 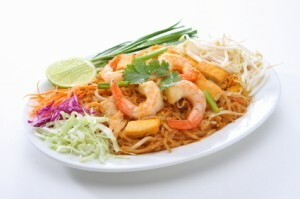 I am also from Nova Scotia, and Pad thai was my fave meal at BP until they took it off the menu. I found a recipe that tastes the EXACT same. Just made it tonight for the first time and I saw this earlier when I was googling the recipe so I thought I would come back online and share! I couldn't believe it lol. Here's the link from the Rachel Ray show. I just used my own chicken rather then the stuff she had made in this recipe since it was quicker & easier. So delish, also it doesn't call for peanuts but I put some in like they do at Boston pizza :) Enjoy!